Background and Objective: Initiation of Insulin therapy during earlier stages has proved to significantly improve health outcomes among diabetics in comparison to oral medications. Not only patients but physicians are also often resistant to early initiation of insulin therapy. The objective was to assess misconceptions and barriers to early initiation of insulin therapy among diabetic patients coming to a diabetic clinic. 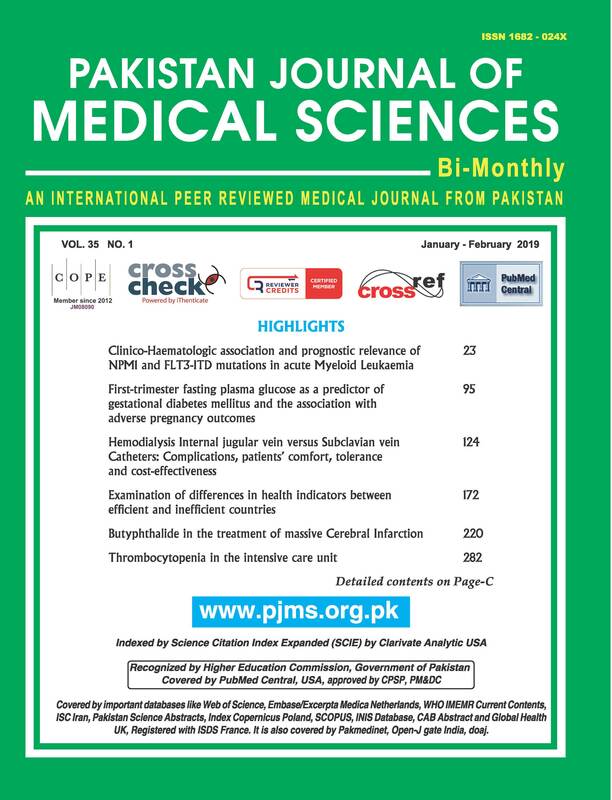 Methods: This cross sectional study was conducted on 300 patients selected by convenience sampling arriving in Diabetes Outdoor Clinics of Mayo and Services Hospitals, Lahore during August 2017 to May 2018. The data was entered and analyzed by using SPSS version 17. Results: Out of 300 patients included in study, 39% (n= 117) were males and 61% (n=183) were females. The mean age of the participants at presentation was 48.46±13.15 years with a range of 13 to 80 years. Study participants considered it embarrassing to inject insulin in public place (p-value 0.01). The fear associated with lifelong commitment to insulin therapy once it is started, was also found statistically significant (p-value 0.001)particularly in subjects who have long duration of DM (>5 years). Conclusion: Perceptions of diabetic patients about insulin therapy are still barriers to early initiation of therapy and tend to prevail in Pakistan and around the globe.